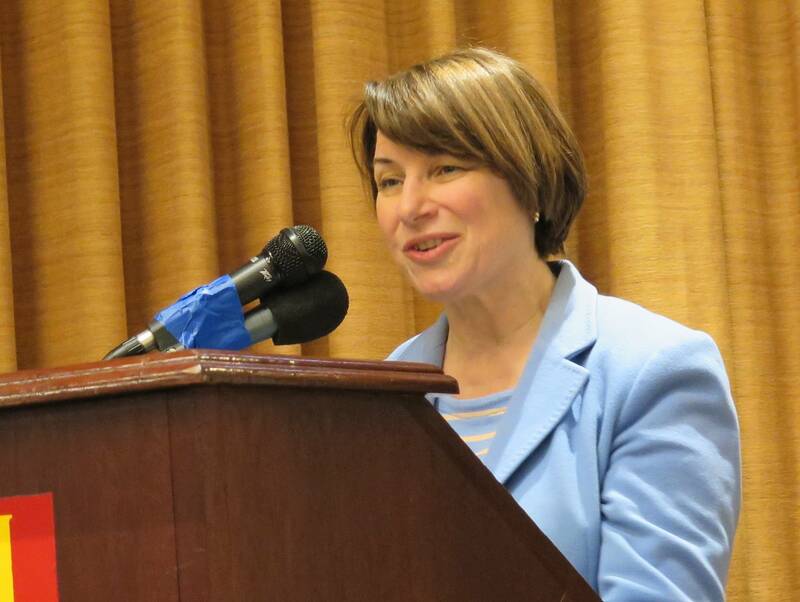 Several dozen Iowa Farmers Union members applauded Saturday as a special guest prepared to speak at their annual convention: U.S. Sen. Amy Klobuchar of Minnesota. "It is great to be back here," Klobuchar said, joking: "As I've said many times, I can see Iowa from my porch." It was a warm welcome back to a state that Minnesota's senior senator has visited numerous times over her 12 years in office. But those visits are getting more attention now that Klobuchar has acknowledged — however tight-lipped — that she's mulling a campaign for the Democratic presidential nomination in 2020. "Obviously people have been talking to me about this, including down here, but I don't have any announcements to make today," she said Saturday. 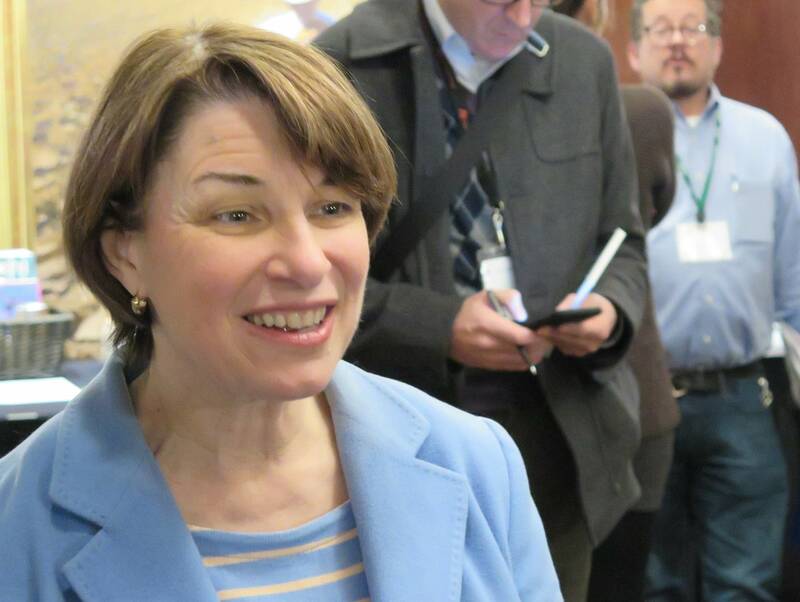 What Klobuchar did talk about to the assembled farmers was her work on the Senate Agriculture Committee, and the preliminary agreement on a new farm bill. She noted that she regularly visits all 87 Minnesota counties, and said she grew up in Plymouth, straddling the metro area and farm country. "And in fact I would ride my bike with my best friend Amy — that was her name, too — to her family's dairy farm, and if I was really lucky we got to milk a cow," she said. Klobuchar laid out what she called a competitive heartland economic agenda for rural America that begins with a farm bill and a strong safety net for farmers, but also includes improvements to broadband, job training programs, and a crackdown on consolidation in agriculture. "I believe that kids that grow up in rural America should be able to stay in rural America and build a life in rural America," she said to applause from the crowd. Klobuchar said tariffs are hurting farmers, and she criticized the Trump White House for downplaying the threats posed by climate change. "The administration of all things put out a report, they put it out on Friday of a holiday weekend maybe so no one would see it, but guess what? Everyone did," she said. "And it really showed what we're dealing with in terms of climate change and the effect it's going to have on farmers right here in Iowa and farmers in Minnesota and rural communities. Klobuchar also talked about the worker shortage in farm country, saying comprehensive immigration reform could help fill jobs. She said rural America will no longer be ignored, and that's its political importance is on the rise. She suggested Donald Trump won the 2016 election because Democrats forgot about the heartland. "Minnesota matters, Wisconsin matters, Nebraska matters, Ohio matters — and, yes, Iowa matters," she told the convention crowd. As Klobuchar mulls a presidential run, one of her biggest fans is Minnesota political icon Walter Mondale, the former vice president who ran and lost as the Democratic presidential nominee in 1984. Mondale said he thinks Klobuchar will run for president in 2020, although he said she has not shared her plans with him. Mondale said Klobuchar's understated tone is exactly what the country needs right now at a time of such division. "She's a person that brings people together and, boy, Americans know we got to do this," he said. "This thing of dividing and fighting and leaving dead all over the floor every time you've had a debate — that, people are getting tired of that. They know it doesn't work." University of Minnesota political scientist Kathryn Pearson says there is likely to be a large field of Democratic presidential candidates, but Klobuchar can set herself apart as someone with a track record of winning big with Democratic and Republican support. "I think we'll hear a lot from her about the fact that she won Minnesota by 60 percent of the vote doing the best of all Democratic statewide candidates," Pearson said. But Pearson said Klobuchar's appeal to moderates could hurt her with left-wing Democratic activists who have a big say in the nomination process. 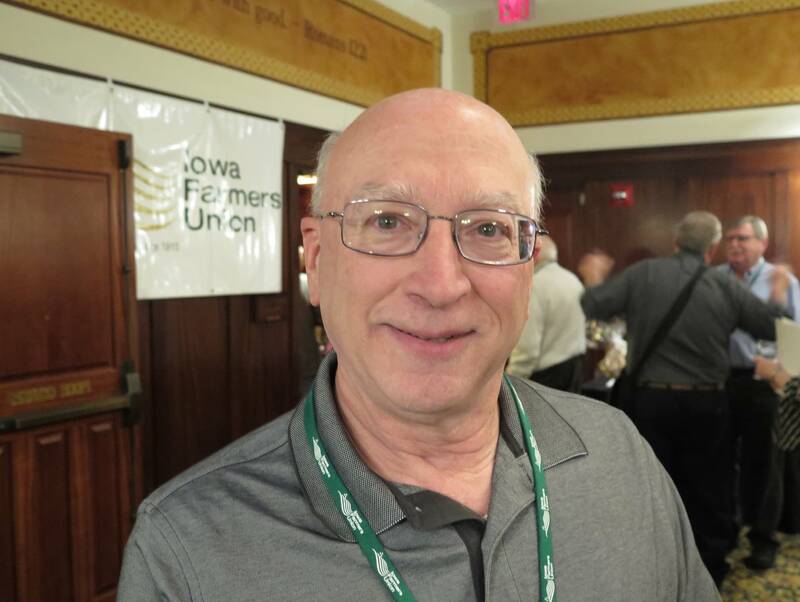 At the Iowa Farmers Union convention on Saturday, Bill Roush, who was attending from Kansas — where he also saw Klobuchar speak — said she's impressive. "She has an upbeat spirit and a positive can-do, these are some things we can do — you know it's not a negative message, it's a positive message, and so I like hearing that," he said. Mondale said Klobuchar needs to decide on a 2020 run sooner than later. He also said her travel schedule will signal her plans: think more trips to Iowa and appearances in New Hampshire and other early nominating states. Correction (Dec. 3, 2018): Bill Rouch's first name was reported incorrectly in an earlier version of this story.